Archaeologists studying Neolithic and Early Bronze Age human remains in the Manx Museum collection for the ‘Round Mounds of the Isle of Man’project have made an exciting discovery. 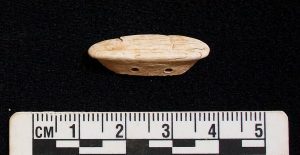 “I opened my email to find a photograph of an extremely rare Bronze Age object – a bone pommel from a bronze knife. This would have been fitted to the very end of the hilt. There are only about 40 surviving knife and dagger pommels of this period from the British Isles, and none have been found on the Isle of Man before – so I was very excited! The size and shape suggest it was once attached to a small knife which archaeologists call a ‘knife-dagger’. Knife-daggers have been found buried with both males and females. Several other bone objects were found amongst the cremated bone. One is a burnt bone point or pin. A recent study of such objects found that few showed evidence of wear on the tip, suggesting that these were not tools, so it will be interesting to examine the end point of this example closely to see if there is evidence of use wear. It is perforated at the other end so may have been attached to clothing or a head covering. Some of the other objects may be burnt bone beads, and there are four enigmatic worked bone strips which we are still working to understand. The objects may have been worn by one or more of the dead as they were placed on the funeral pyre, or may have been placed by the dead on the pyre by mourners. It is possible that there were multiple episodes of burial in the cist, but we do not know how many of the individuals were buried at the same time and with which objects or how many cremation events took place. Round mounds are found through the British Isles and in Continental Europe. In the British Isles the earliest round mounds appeared in the Neolithic period, after c. 3800 BC. More were built periodically over the next 2500 years or so. The current project aims to investigate what these sites and their associated burials, people and artefacts can tell us about life on the Isle of Man and interaction with other communities across Britain, Ireland and potentially beyond. It includes analysis of the landscape location of the mounds, geophysical survey at several sites, and re-analysis of both previously excavated remains and records of previously destroyed or excavated sites. The project, which began in September, is directed by Dr Rachel Crellin (University of Leicester) and Dr Chris Fowler (Newcastle University) and has received funding and support from Culture Vannin and Manx National Heritage. Culture Vannin funded the examination of the human remains and are also supporting a series of workshops for school children that will be delivered by Michelle and Rachel in 2017 across the island. For more information about the project please visit: https://roundmounds.wordpress.com/.